Whopper's Bunker: Operation: Neptune Spear goes graphic! The daring secret mission to get Osama bin Laden by elite U.S. forces will be told in the pages of a graphic novel that aims to shed more light — with a bit of creative license — on the event. Capt. Dale Dye (USMC, Ret.) 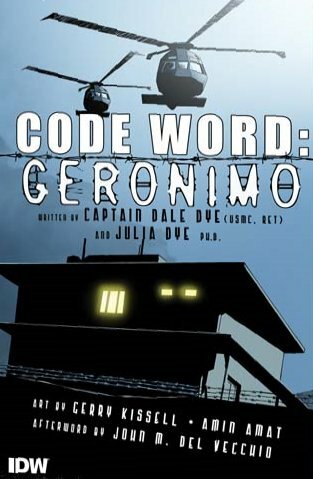 and Julia Dye have written an 88-page hardcover graphic novel Code Word: Geronimo which takes a look at the mission that killed Osama Bin Laden. Illustrated by artists Gerry Kissell and Amin Amat; IDW which currently publish the G.I.Joe titles say that this will be a politic-free look at the planning and execution of this incredibly daring mission.